There is no doubt Discourse is the best Forum open source software available out there for us. Almost started a 4 years ago, Discourse.org became very popular among all vibrant technical communities. Some big communities including Twitter developer forum, Feverbee community, Sitepoint forums all runs on Discourse. At Crunchify, we moved our Crunchify Forum to Discourse almost a half year back. 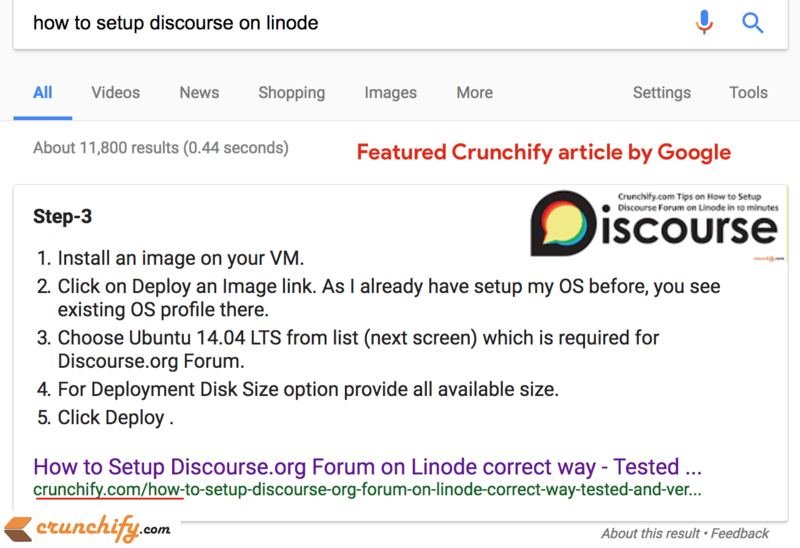 We have published number of very informative tutorials on Crunchify about Discourse Installation on Linode, Setting up Email right way, Customization tips and lot more. I ran Discourse Forum couple of months on Linode and loved it. I was happy with it but the only problem I faced was about managing my own node and maintaining OS image with all patches to make environment secure. And that’s a reason I moved to DiscourseHosting solution, one of the best managed hosting solution for your Discourse forum. How to get started with DiscourseHosting.com Setup? Here is a link: https://www.discoursehosting.com/. Take a look at some documentation there and you should be able to setup everything within 5 minutes. One of the simplest plan page I’ve seen so far. Choose the best plan as per your need. Basic plan starts from $20/month and Business plan is just $80/month. If you are an organization and need big forum for your company then you can contact them and support person will reply within 6 hours as per my experience. Create new Subdomain as per your need. Usually if your blog name is crunchify.com then your it’s best option to set up Forums on https://ask.crunchify.com. Provide Hostname value. In my case it’s crunchify. With this hostname, now your forum will be accessible with URL crunchify.discoursehosting.net. If you have your dedicated domain name then provide it as External Hostname. In my case it’s ask.crunchify.com. Click on Set Default. This will redirect https://crunchify.discoursehosting.net URL to https://ask.crunchify.com URL. Click on Save changes and all changes will be saved. Look for entry ask.crunchify.com and point A records to an IP address, with a CNAME to crunchify.discoursehosting.net. Make sure to change IP as per you provided in your discoursehosting’s admin panel. If you are using Google Domain then just add forum subdomain and IP address as you see in below image. Just visit your forum URL and you will see new Welcome Setup screen. There are 13 different steps you need to follow in order to setup Discourse right way. It’s very simple. So far our Crunchify Forum is working perfectly fine. We usually revisit our review post and update our feedback every 6 months. Hope you find above steps useful. Let me know if you have any questions.